Back at Beer Market at my request, because I want to try one of the special pizzas. Anyway, the famous beer market exchange needs no introduction - we are all familar with the "buy when low" routine, I believe? We had a round of Spring Rolls and Luncheon Meat Fries (also known as "spam fries") - the latter was crispy and simply tasty (they were not even salty). We had 3 - 4 servings of the Luncheon Meat Fries that night alone! We had to choose between the Chicken Rice Pizza and the Salted Egg Seafood Pizza (SGD$21.90), since everyone claimed they were full. So we settled for the latter. The crust was crackling and thin, smeared generously with cheese and salted egg. There were good bits of squids and prawns, but the salted egg could have been richer / thicker. Instead, the salted egg coating was rather thin as well, unable to overcome or stand out against the seafood and cheese flavours. Been to Beer Market a few times, and tonight it's the chosen venue for light dinner and chilling out again - think, wide variety of good beers, good food and live band throughout the night. One descends the steps leading up the the bar / pub / lounge strategically located in Clarke Quay, where happy drinkers are strewn all around the area. What's interesting is is the long bar counter, and comfortable seats flanked by lovely ancient streetlamps lighting up the dim bar. Lots of screens list the "Beer Market Exchange", where the prices of many beers are listed and updated every half an hour. The more popular the beer, the higher the price and vice versa. So, feel free to bid for your favorite drinks! We started with the Rojak Platter ($39.90) - not called so because there's Rojak literally, but because there's an assortment of different items in this delicious platter. 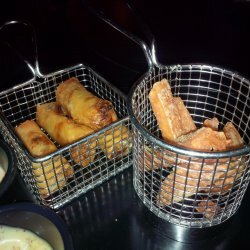 There were fried spring rolls, sauteed mushrooms, mini Japanese sausages, french fries, Thai fish skin and my favorite luncheon fries - lovely accompaniments to go along with our chilled drinks. We wanted to try one of the mains despite being full - there were three of us plus somemore later on, but the platter was more than filling already (and not to mention beer is filling, too!). Beer Market has a really interesting menu here, and a couple of pizzas that looked tantalizing -Chicken Rice Pizza and Salted Egg Seafood Pizza. In the end we settled for their signature Beef Hor Fun (SGD$14.90) - delicious and smooth strips of hor fun with tender Tenderloin beef strips, topped with French Onion Soup gravy! Serves yummylicious local food with a twist!! Great place to get together over drinks and a hearty meal. Beer market serves a wide range of beer from all over the world, we particularly liked the Banana Bread beer as well as some of their other fruity selections like Lychee and Mango beer. Not only this, food served is not like any other ordinary bars. 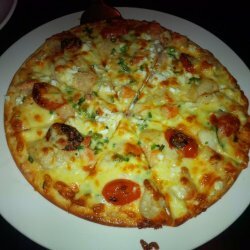 Try their unique fusion of east meets west combi like their Chicken Rice Pizza, Beef Horfun with french onion soup as well as their Tiger Radler shooters with seafood which are incredibly fresh!!! Awesome place for nice food, music, sports & beer! Beer Market is the perfect blend of good quality food, music and sports whereby the prices of the beverages move according to demand, creating an exciting atmosphere and interactive experience. Obviously, the concept of Beer Market was inspired by the dynamics of the stock exchange. Buy Low Drink High! Beer Market will get you high on food and beer! The service here was very good as we were served by a very friendly auntie! 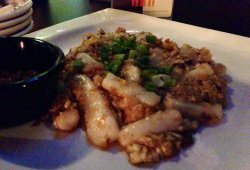 Beer Market definitely is an awesome place to chill out with friends, with nice food as well as a great place to watch football! Fluctuating Prices at Beer Market! 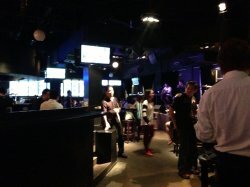 Beer Market is one of my favourite bars to go when I simply want to catch up with my friends! The interesting concept of stock market style beer prices caught my attention from the start as they fluctuates up and down according to demand level every 15mins. 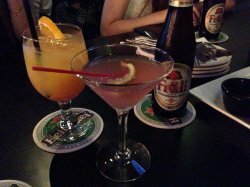 Since I'm not a pro drinker or anything, I would just always try to order different cocktails and beer to try out. Besides the alcohol, they do have an interesting menu with local flavours incorporated! Have ordered their Baked Honey Glazed BBQ Wings ($10) and it's one of the nicest wings I've tried compared to several other bars. The wings also comes in crispy and spicy. 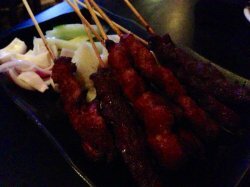 The Satay Platter - 8pc ($6) was also really good! Regretted so much not getting more but the grill was so tender and juicy. Service was prompt as it came to pretty fast, served hot. There was also the Carrot Cake ($10)! I can't really tell how they cooked it differently compared to the ones we get outside but this was delicious! The chili was really hot and spicy as well but matches really well with the overall flavour of the carrot cake which gave me a distinctive taste. Overall, I enjoyed myself pretty much here. 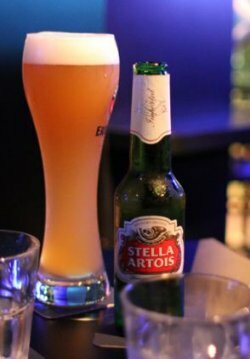 The wide variety of the beers and cocktails along with the service, ambience and awesome food would definitely attract me to going back! Will try to go earlier next time to get lower beer prices! Beer Market is another pub I had like to hang out in and this time I brought my drinking buddy here for dinner. Having tried their fried carrot cake, I decide to try their western cuisine and ordered the Spaghetti Carbonara and my favourite Strawberry Fruli Beer. 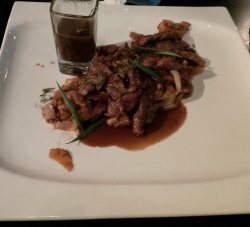 My friend ordered some hamburger steak, but I didn’t get to try it as it’s beef. Besides the mains, we also had ordered the nacho chips with cheese as an appetizer while waiting for the food (which normally takes quite a while). Anyway it’s hard to find good carbonara pasta in Singapore but I still held a teeny weeny bit of expectation that the ones served at BM will surprise me but it didn’t. It came with some bacon bits but didn’t add much flavour to it. The nacho chips were served warm, as if it was just baked and when paired with the cheese (which is equally served hot) were so hot. The chips came with a tinge of salt so it’s good on itself too. As usual there is a live band playing so we got to enjoy good music while having dinner. Though at the time of my visit, there was a mini-party to the side of the pub and so it got increasingly noisy and difficult to hear the band playing. 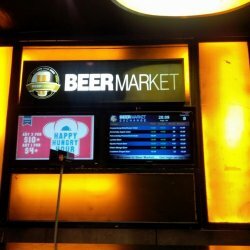 Beer Market is a pub but adopts a stock market exchange concept. When you enter the pub you will see the television screens hanging at different parts of the pub and on it the listing of all the beer retailing at Beer Market. They would show the current price of each bottle/glass of beer and the highest price it retailed at each week. You can either buy the beer now or buy in bulk and sell it when the stock price raises. There are different live bands at different days of the week and this adds to the ambience of the pub. 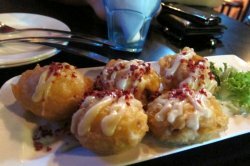 I ordered a fried carrot cake ($10) and they were scumptious. Despite the high price, it proved to be worth every dollar. 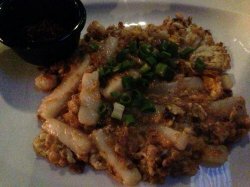 I also love the chilli that came with it, unlike the conventional carrot cake served in hawker centres whereby they mix the chilli in while cooking the dish. 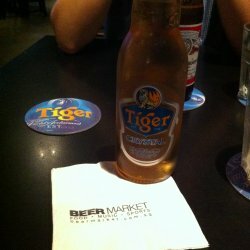 I enjoyed the wide selection of beers offered at Beer Market. I was plesantly pleased with the food served because their main selling points are the beer. I really enjoyed their honey glaze chicken wings which were really cheap ($3) during happy hour which ends at 8pm.The wide variety of craft beers here left me spoilt for choices. I love the refreshing taste of their lycee beer. Would love to try their strawberry beer on my next visit!Love the live band performances here too - they're a duo known as Shili and Adi. Both of them had really good chemistry. Besides having amazing voices, they did a very good job at connecting with the audience too. 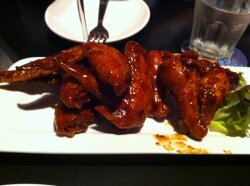 I really enjoyed their honey glaze chicken wings which were really cheap ($3) during happy hour which ends at 8pm. The wide variety of craft beers here left me spoilt for choices. I love the refreshing taste of their lycee beer. Would love to try their strawberry beer on my next visit! Love the live band performances here too - they're a duo known as Shili and Adi. Both of them had really good chemistry. Besides having amazing voices, they did a very good job at connecting with the audience too. come back for their happy hour! i had no idea what this place was about before i came here! apparently it's quite popular haha. and why wouldnt it be, when they have $2nett fries and wings during their happy hour?! there, you took a second look right! it's so amazingly cheap! haha. sadly we didnt go there during the happy hour though!!! 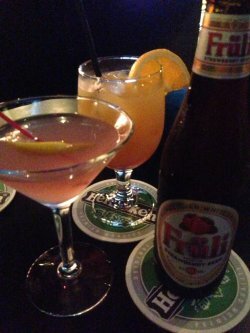 >.< cos we went there on friday, and they dont have happy hour that day. but i really have to say that their food was pretty good! although we didnt get their fries or wings, we loved all the other food we ordered! but let's not go off track haha, the deep fried mushrooms with honey mustard dressing were such a good way to whet our appetite! i suppose since it was mushrooms, it felt relatively light, and was piping hot inside with lovely juices that made it absolutely delectable! we ordered two pizzas to share among the five of us. i loved the teriyaki chicken pizza ($17)!!!! i didnt have much expectations for this place cos i just thought they would probably serve regular bar grub that was only so-so, but i have to say i was really pleasantly surprised! 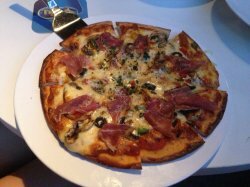 the parma ham pizza ($19) wasn't as outstanding as the teriyaki chicken one in my opinion, but that isn't to say that it wasnt good! in fact, it gave off this 'comfort food' vibe which i quite liked! it had a subtle flavour of smooth cheese and the slivers of parma ham were delicious. that's all we ordered, plus a few bottles of beer. and it was quite a good amount for the 5 of us! definitely will come back one day for their happy hour! Hubby and I were at Liang Court having dinner , I didn’t eat much so we walked over to clarke quay to grab a few bites. 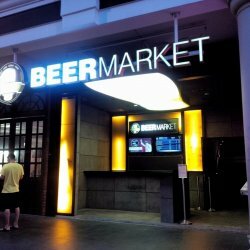 Walked past beer market, I recall our last visit to the crown centre branch, we went in to get some finger foods. 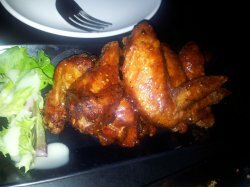 The order came shortly served by friendly staff; I loved how the chicken wings were presented as it was glossy under the dimlight ! 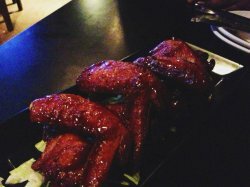 Succulent wings tasted tender ; coated with tangy and sweet thick bbq sauce that felt like it went on and on around my mouth till we finished. 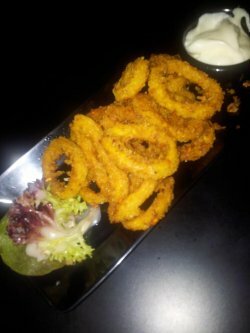 Calamari coated with a crispy batter , chewy insides and went well with the mayo dipping. Unfortunately, it was very oily and I was fussing about it , shaking it off and letting it drain on my own tissues. A great place for catching up with friends, the beer market does have a live band, which is one of my favourite things in a place (as long as the band is good obviously!). However, try not to seat near the speakers or else you’ll be yelling in each other’s ears trying to be heard all night! The Beer Market Burger ($14) had a char-grilled beef patty with BBQ sauce served with thick cut fries and fresh salad. While the burger was delicious thanks to the massive patty and generous lashings of BBQ sauce (one can never go wrong with BBQ sauce! ), the fries were a disappointment because they arrived cold and a little soggy. Which is probably the worst state fries can be served in. 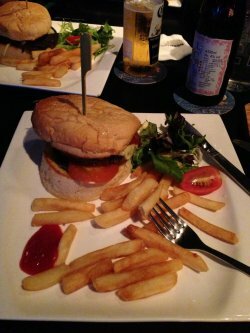 Nevertheless, the burger and salad made up for it although I feel that if they had perfected the fries, or at least served them while they were hot and fresh, it would have made the dish truly excellent. 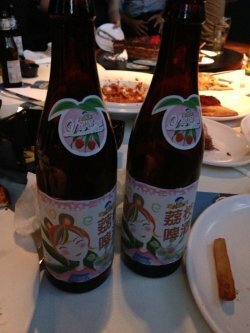 I also got a lychee beer ($12) because I’m a typical girl who does not like the taste of beer but the sweetness and lychee-flavour helps to get me through a bottle or two. The cool thing about beer market is that the prices of beer follow that of a stock market and change throughout the evening depending on demand and supply. You can view all the beer prices of tv screens scattered around the eatery which is an interesting and unique concept. It does feel sad when you realize you could have paid less for your drink but that’s the stock market for you. I’ll definitely be back with some friends soon! THis is one of my favourite venue to hang out with my ex-classmates whenever we are free. Although my ex-classmates are usuallly here for beers, but for me I am here to have their french fries with cheese sauce. THe presentation of it may look really simple, but the taste is really good. The french fries are very crispy and not too oily nor salty. 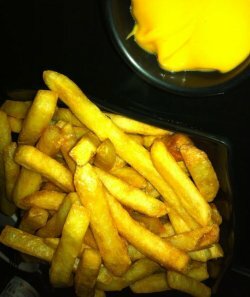 THe cheese sauce is also very thick in texture and great for dipping the french fries. Usually I will order two portion of it for myself to enjoy. Was around Clarke Quay area so we decided to find a place to chill out before heading home. 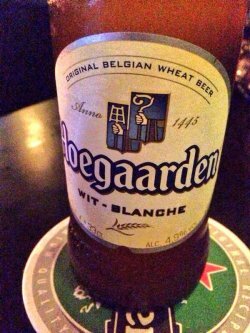 Not the first time visiting Beer Market as this place is kind of like our usual hangout place if we crave a bottle of a nice cold beer. Ordered their signature buffalo wings (spicy, $10) and a bottle Budweisser and Tiger Crystal to go with the spiciness of the wings. Wings there is really good, crispy skin top with thick spicy gooey sauce makes your stomach burn but you will never get enough of it. Thank god we have our beer not I guess we will be spitting out fire. There's a live band area and sports area cater for different kind of customers. Each night there will be different band performing for the crowd, from 8pm-12am I think. Beer market is spacious and the servers there are attentive. 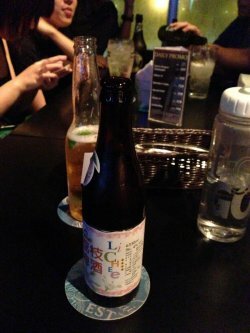 Currently they are having a promotion of 10% off beer if you are a member of NTUC union. Check out their Monday promo and Hungry Hour (mon-thurs (6pm-8pm) and whole of sunday) for $3 wings/nacho cheese/sausage. $3 for the wings.. I guess it's pretty worthy considering all prices stated there are NETT price. Definitely not the last time I am going there. I love this place. They have a wonderful and great environment to chill and relax. Indoor smoking area for the convenience of everyone. 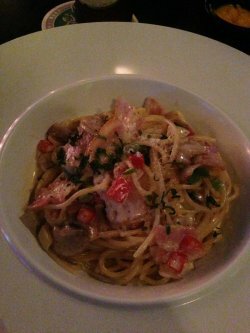 The food is really really cheap and nice most important their portions are really generous. I love their Honey Chicken Wings that cost only $3 and their fries too. After trying their chicken wing,you will never find anything comparable anymore. 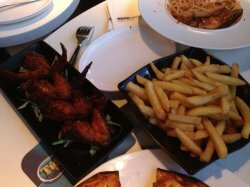 After trying their Chicken Wings i constantly have the super craving to go back and have more or even just pack home and share with my family. Super relax to watch Soccer and drink beer and have finger food at the same time. I tried their Strawberry beer which was fantastic and tasty. I always find beer very bitter but this is the best beer that i have ever tried. It is sweet and tasty jut like sparkling juice. A NO.1 place to chill out with friends. i had no idea what this place was about before i came here! apparently it's quite popular haha. and why wouldnt it be, when they have $2nett fries and wings during their happy hour?! you took a second look right! it's so amazingly cheap! haha. sadly we didnt go there during the happy hour though!!! >.< cos we went there on friday, and they dont have happy hour that day. but i really have to say that their food was pretty good! Although we didn’t get their fries or wings, we loved all the other food we ordered!